This summer I started a daily walking ritual—typically in the morning before beginning to meet the day’s demands. 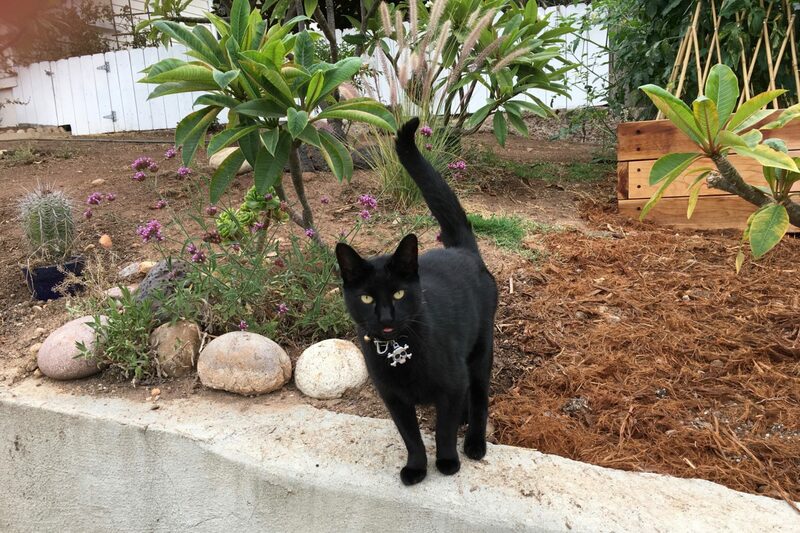 Recently, I often will see a black cat in the yard next to the Butterfly House, which is a home-made sanctuary for Monarchs, Humming Birds, and other flying and flirting creatures. It is midway from Meade down Maryland Ave. The location is dangerous for cats, being diagonally crossways to a cliff leading into a canyon known to be a coyote habitat. Timing is important for seeing Skull, which is my made-up name (not knowing the real one): When the sun is high enough to cast light over the houses. Today’s selection is from several shot on Sept. 12, 2016 at 8:35 a.m. using iPhone 6s Plus. Vitals, for the Featured Image: f/2.2, ISO 25, 1/135 sec, 4.15mm. Also in this series: Scruffy, Roly Poly, and Woo.